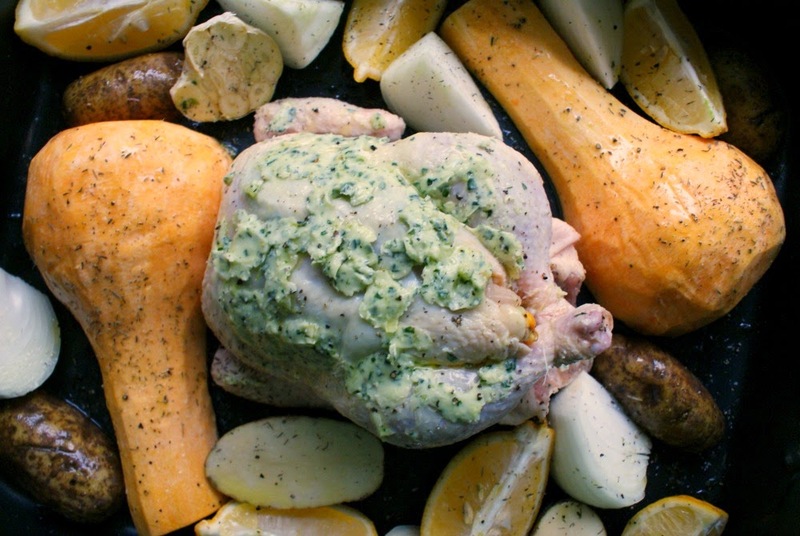 Roast Lemon Chicken with Garlic and Herbs is a crispy-skinned, extra juicy, oven-roasted chicken with the clean, classic, bright, and fresh flavors of lemon, fresh herbs, and garlic. I love when a meal comes together just perfectly. This one sure did and we loved every bite of it. I am finding more and more that when I use fresh, vibrant, classic combinations of flavors in my cooking paired with simple seasonings and fresh meats and vegetables, the results please the whole family and everyone scarfs it down. We started making a consious effort to eat more "clean" a few years back. The more we read labels, the more we didn't want to eat. Now don't get me wrong. We are by no means a completely "whole food" eating family. My kids still love to shovel down the cheezy poofs and boxed cereal, but we are eliminating more and more junk from our diet all the time. While we are working towards removing the junk, we are adding in more and more of the good stuff. Vegetable gardening has given us a greater appreciation for the undeniable fresh taste of home-grown veggies and we now grow to supplement our grocery shopping year round. For this meal we paired a whole chicken, butternut squash, potatoes, and onions with simple fresh herbs from the garden, salt and pepper, olive oil, lemon, and garlic. The natural flavors of the components shined and everthing came out absolutely delicious. A little bit of garlic and herb seasoned butter tucked under the skin helped make the chicken extra juicy and the lemon, garlic and herbs stuffed into the cavity of the chicken made the dish aromatic and very flavorful. 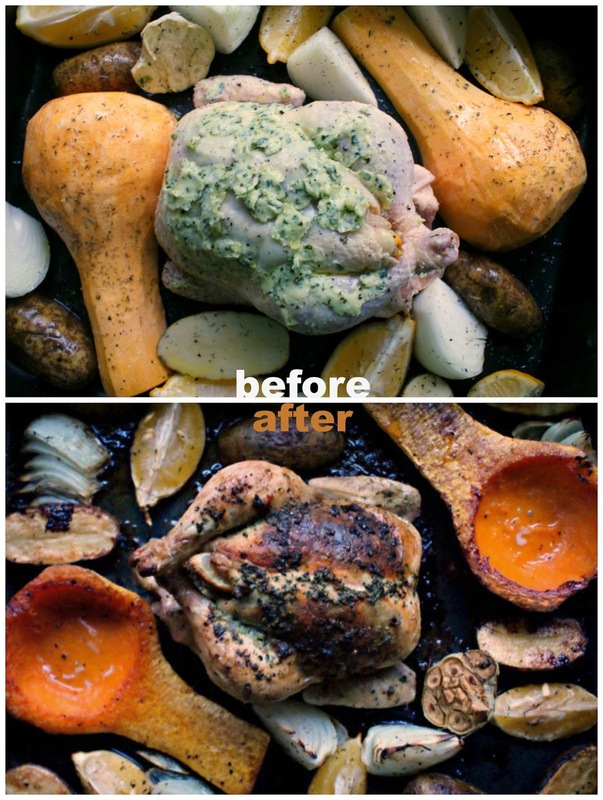 I will make this healthy, clean, delicious, and flavorful chicken recipe again and again! Perfect for Sunday dinner with my family or to serve to guests. You'll love it! Preheat your oven to 375°. Drizzle a few tablespoons of olive oil into a large roasting pan. Break off 1 clove of garlic, peel, and mince. In a small bowl, mix together the minced garlic, butter, and minced herbs. Generously salt and pepper the inside cavity of the chicken. Stuff the chicken with the bunch of thyme, some lemon slices (2 or 3, whatever you can fit), and one of the halves of garlic. Gently separate the skin from the breast of the chicken with your finger. (See this in pictures here.) Fill the area under the skin with half of the butter mixture. Spread the rest of the butter mixture over the outside of the chicken. Tie the legs together with kitchen twine (dental floss works, too). Place the chicken into the center of the roasting pan. Place the butternut squash face down in the pan on either side of the chicken. Fill in the rest of the space in the pan with the potatoes, onion slices, garlic, and cut lemons. Generously drizzle the vegetables and chicken with olive oil and season with salt and pepper. Squeeze one or two of the slices of lemon over everything in the pan. Roast in the preheated oven for 1 hour and 15 minutes (internal temperature should read 165°), flipping the vegetables about two-thirds of the way through the cooking time. Tent with foil and let rest for 10 minutes before serving. You can easily substitute other veggies to suit your tastes. Hearty root vegetables like sweet potatoes, or carrots would work well. I only used one head of garlic (as seen in the picture) because it's all I had. I've upped the amount in the recipe because I wish I had had more! 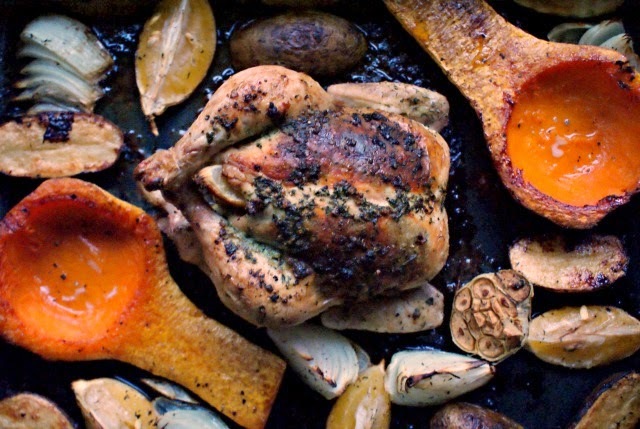 You can use the leftover garlc you roast for so many things! I was late getting dinner to the table so I decided to not make a gravy, but it's a sin not to use all of the yumminess left in the pan! With a quick splash of white wine mixed with the lemony pan drippings simmered with some chicken broth and corn starch, you can make a mouthwatering gravy that would be amazing with this chicken. My Mom told me she thought the chicken looked burned, but I assured her (and you!) that it's not! The herbs turn a dark color when roasted on top of the chicken and I like a deep brown crispy skin. If you find that the skin is getting too dark for your tastes, you can always tent it with foil after you flip the veggies and contiinue the cooking time with it tented. Inspired by Ina Garten's Lemon and Garlic Chicken. Shared for Wednesday Whatsits on Real Housemoms. Want to pin both images? Use this Pinterest-friendly collage to pin this recipe to your Pinterest boards so you can easily find it later!